When you love the sound of the HD 4.40 Wireless, that’s no coincidence at all. 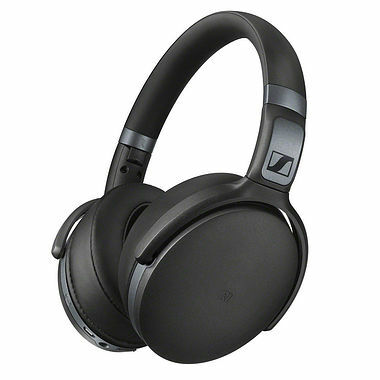 The closed-backed design of this headset is fitted with proprietary Sennheiser drivers that came a long way before being allowed to transmit sound to your ears. So, enjoy their well-balanced, amazingly detailed sound with dynamic bass. The HD 4.40 Wireless is about freedom of movement. Thus, no cable. Instead you get the latest wireless technology and audio codec with Bluetooth 4.0 and aptX for reliable transmission and true wireless Hi-Fi sound. Control is all at your fingertips: Want to take or make a call, change a track, adjust the volume? With the intuitive ear-cup mounted controls and the integrated microphones of the HD 4.40 Wireless all this is actually fun. Have a try. The HD 4.40 was made to go places with you – and make these places more pleasurable. With its around-ear design and deep, ergonomically designed ear pads it offers comfort even during extended listening sessions. Its robust foldable headband design that can be easily and compactly stored in the supplied protective case makes for perfect portability. Elegantly minimalistic – using tough, high-quality materials: That is how the HD 4.40 Wireless was designed. Its sleek frame not only makes it more comfortable to wear, it also makes a statement of timeless class.